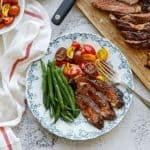 Grilled Ribeye Steak Recipe with Tequila Barbecue Glaze - Easily learn how to grill ribeye steak made perfectly tender and flavorful with a sweet yet tangy ribeye marinade. Whisk together all ingredients and pour into a large freezer sized bag. Next add Ribeyes and marinade in the refrigerator for at least 6-8 hours. In a small sized pot, add barbecue sauce, tequila, soy sauce and Worcestershire sauce over medium heat. Once the mixture begins to bubble, whisk in brown sugar, garlic powder, paprika, and salt and mix until combined. Remove steaks from marinade and season with salt and ground black pepper. Place steaks on medium grill. Grill steaks for 3-5 minutes on each side depending on level of doneness you prefer and thickness of steaks. Next brush glaze on both sides of each steak and grill an additional minute on each side until glaze caramelizes. Transfer steaks to a plate and allow to rest for at least 5 minutes. Once rested, serve with additional glaze. For more information on grilling visit www.beefitswhatsfordinner.com/cooking/grilling.